The type 2 deiodinase (D2) activates the prohormone T4 to T3. D2 is expressed in skeletal muscle (SKM) and its global inactivation (GLOB-D2KO mice) reportedly leads to skeletal muscle hypothyroidism and impaired differentiation. 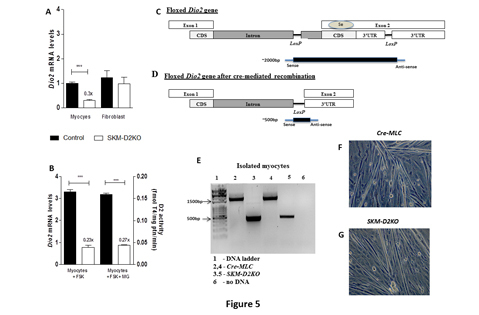 Here, floxed Dio2 mice were crossed with mice expressing Cre-recombinase under the myosin light chain 1f (cre-MLC) to disrupt D2 expression in late developmental stages of skeletal myocytes (SKM-D2KO). This led to a loss of approximately 50% in D2 activity in neonatal and adult SKM-D2KO skeletal muscle and about 75% in isolated SKM-D2KO myocytes. To test the impact of Dio2 disruption, we measured soleus T3 content and found it to be normal. We also looked at the expression of T3-responsive genes in skeletal muscle, i.e. myosin heavy chain I, alpha actin, myosin light chain, tropomyosin, serca 1 and 2, which was preserved in neonatal SKM-D2KO hindlimb muscles, at time that coincides with a peak of D2 activity in control animals. In adult soleus the baseline level of D2 activity was about 6-fold lower and, in the SKM-D2KO soleus the expression of only one out of five T3-responsive genes was reduced. Despite this, adult SKM-D2KO animals performed indistinguishable from controls on a treadmill test, running for approximately 16 min and reached a speed of about 23 m/min; muscle strength was about 0.3 mN/m/g BW in SKM-D2KO and control ankle muscles . In conclusion, there are multiple sources of D2 in the mouse SKM and its role is limited in post-natal skeletal muscle fibers. Thyroid hormone signaling in male mouse skeletal muscle is largely independent of D2 in myocytes. Joao P. Werneck-de-Castro, Tatiana Fonseca, Daniele L. Ignacio, Gustavo W. Fernandes, Cristina Andrade, Lattoya Lartey, Marcelo B. Ribeiro, Miriam O. Ribeiro, Balazs Gereben and Antonio C. Bianco. Endocrinology. Jul 27, 2015. PMID: 26214036.